An executive or leader has been accused of sexual harassment. Remedial action needs to be taken to protect the company, save the leader and ensure it doesn't happen again. "Tim Mulvaney has been an incredible resource"
"What Courageous Conversations did for me"
"You're willing to try anything"
"I love what you're doing"
"...a half-million dollars in new business"
"In business terms, it meant a half-million dollars in new business" - Trey Birdsong, Director, The Coleman Center. Click here to download a sampling of client letters we have received over the years. Abuse Women? Fine. Insult the Boss? You're out. Interesting article from today's New York Times on the ongoing, long-running saga of Charlie Sheen and his personal and professional life. This is an excellent illustration of the accommodations, the excuses, the alibis that get created to not deal with inexcusable, inappropriate, offensive behavior. Especially with a star performer. The Charlie Sheen saga is a bit over the top, but the process is the same as I continually see in organization's that don't want to upset the apple cart and take on a popular, successful employee's behavior. Talk to you soon, Tim. Stephen Kozuch and Vivian Kaufmann make it so easy to build your financial future. They are the best in the business. For the last 173-years, HDWC has been providing services and support to children and families in crisis through its adoption, foster care and after-school programs. Click on the link to learn more and contribute to its mission. Where do you find out about creative, cutting-edge training techniques, job opportunities, and a professional community? ASTDNY. 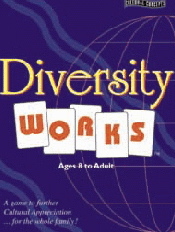 This entertaining and educational card game highlights and values the cultural diversity around us. "Diversity Works™" highlights more than 60 cultures and is an interesting and informative way of fostering cultural appreciation. Check out our colleague, Jim Oher's, blog on conflict management and other difficult situations.